Highly rated coming into the NFL draft despite some concern about his size, Vilma was chosen by the Jets in the first round (12th overall). When starting MLB Sam Cowart was injured early in the season, Vilma took over and held onto the job thanks to his excellent speed and athleticism. Jets went 10-6 to finish second in the AFC East and qualify for the playoffs as a Wild Card. Won AFC Wild Card playoff over San Diego Chargers (20-17). Lost AFC Divisional playoff to Pittsburgh Steelers (20-17). 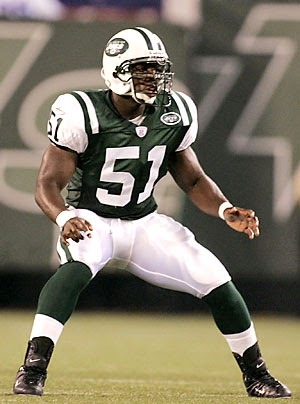 Vilma followed up his outstanding rookie season by recording 128 tackles and gaining selection to the Pro Bowl in 2005. The shift by the Jets from a 4-3 to 3-4 defense in 2006, where he was not an ideal fit, was a setback and in ’07 he went down with a season-ending knee injury in the seventh game. Vilma was traded to the New Orleans Saints where he was able to thrive again in a 4-3 scheme. He was selected to the Pro Bowl following the 2009 and ’10 seasons. However, he was initially suspended for the 2012 season for his alleged role in the Saints bounty scandal, but was reinstated by court decision and played in 11 games. A knee injury kept him off the field for virtually all of 2013 and he was not re-signed for 2014. Overall, Vilma played in 125 games and accumulated 10.5 sacks, 12 interceptions, 11 fumble recoveries, and over 600 tackles, scoring three TDs (two on interceptions, one on a fumble recovery). He was named to the Pro Bowl three times.